Vanity aside, Wired published a very well written article on Art.sy [link] in the December issue. I think it’s objective, describes the company vision well, and the story about a mobile prototype is completely accurate. Also, got to love the photo taken at Haunch of Venison! We’ll be at Miami Basel Nov 30th-Dec 3rd, don’t forget to say hi! 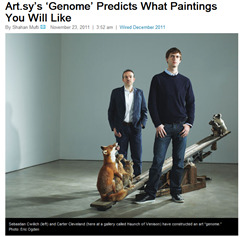 Me in Wired: Art.sy’s ‘Genome’ Predicts What Paintings You Will Like was published on November 24, 2011 . See a typo?